yay first. Interesting. I like the blurb on the right saying that Nintendo is beating Sega by seven times and thats before the release of the Virtual Boy in Japan. Lol sauce. Why is it that these Magazines can never spell “Ness” right? 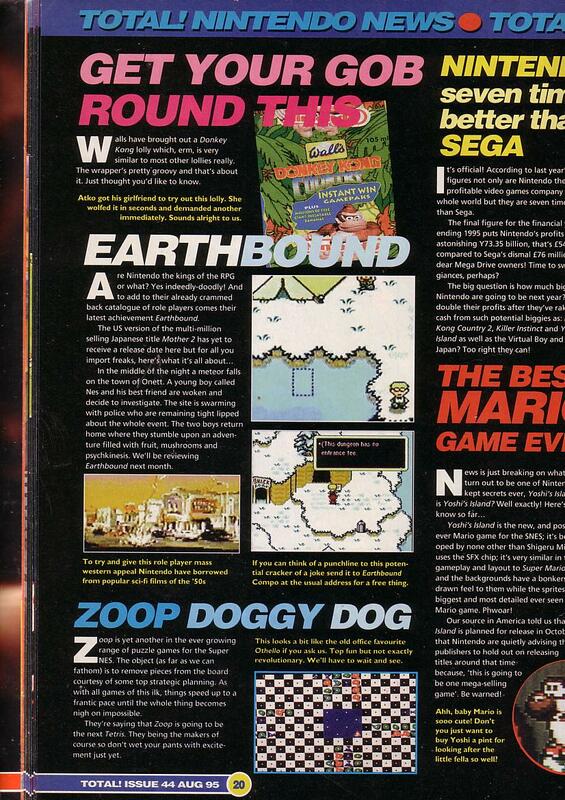 It’s nice to see that they mentioned Mother 2. Kind of interesting that two of the three scenes are from Winters. Kind of paints Jeff as Ness for those reading about the game for the first time. Just an observation, ha ha :). Look at the caption beneath the picture with the pencil statue. I wonder what the prize for sending in a good punch line was. Very groovy. But I would hardly call Pokey/Porky Ness’ best friend. Is Ness’s name really that hard to remeber? Actually, a Japanese gameguide for Mother 2 actual romanized his name as “Nes” as well (I believe that same guide also correctly romanized Pokey’s name as Porky too). It does also make the pun off of NES a bit more clear. Perhapes it was the NOA localizers that got the name wrong. It seems like they like you, “Nes”! I’ve never seen the scene with the UFOs attacking the streets zoomed in like that. It makes me wonder exactly what they did to make that one screen in the game. My name’s Ness, but all my friends call me Nes. It’s shorter. “multi-million selling”? wasn’t there a post here that said mother 2 only sold like 300k in japan? What’s with the dotted line in the top right EB screenshot? Ah, the 90’s… People didn’t worry about political correctness as much back then. Also, Mato, I’m loving these ads! More like it’s a European magazine. Drinking a pint over there is usually the first ‘adult’ privilege you receive, unlike in America where it is the last. Although talking of pints and Earthboundy goodness didn’t save them. The magazine went under towards the end of 1996. Did anybody else notice the line “Yes Indeedily-doodily!”? Who wrote the thing, Ned Flanders? Lol, Pokey is his best friend. Yeah, the “Nes” thing is an alternate romanization more than anything else. The fact that the game was never actually released in Europe doesn’t help. I’m personally more interested in that sepia-ish bottom picture… is that a beta shot?! ^Ugh, never mind, I just realized it was a REALLY fuzzy screenshot of a portion of the gas station screen. My bad.